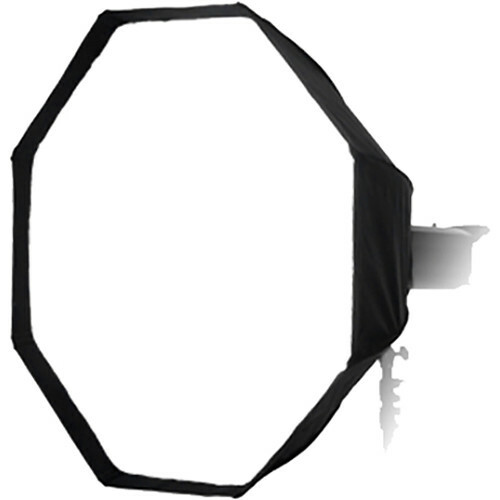 Able to be opened up like an umbrella, the 36" EZ-Pro Octagon Softbox from Fotodiox will make set up and tear down much simpler. Able to soften and diffuse light and create beautiful rounded catchlights, the octagonal softbox is a classic modifier both in studio and on location, and this model features a heat-resistant design and sealable venting to support a variety of different types of fixtures. It uses a silver interior to maximize output and features both an inner baffle and front diffuser to produce an even quality of light, and these do not need to be removed for storage. Another customizable advantage of this softbox is the inclusion of an accessory that can transform your box into a collapsible beauty dish. This accessory can also help reduce hot spots when using a diffuser. Users can pick up an optional fabric grid, as well, to control light spill. This model comes with a rotating speed ring with locking thumbscrew which features an insert that is compatible with most Photogenic lights.